An internal investigation has slammed the State Department’s record-keeping practices. The department was hit by an AP lawsuit over unfulfilled requests for documents and emails from Hillary Clinton's tenure as secretary of state. The State Department’s Office of the Inspector-General published a report (PDF) Wednesday criticizing the failure of many employees to preserve emails as official records. Even though a 2009 upgrade to the department's email system made it easier to enter emails into the record, “employees created 61,156 record emails out of more than a billion emails sent” in 2011. 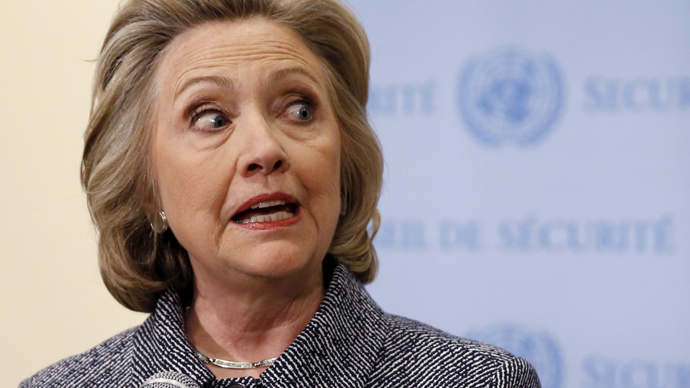 Even fewer official emails – 41,749 – were recorded in 2013. “System designers in the Bureau of Information Resource Management need more understanding and knowledge of the needs of their customers to make the system more useful. A new procedure for monitoring the needs of customers would facilitate making those adjustments,” the OIG report says. The OIG report’s release came on the same day the Associated Press filed a lawsuit against the State Department, following years of unsuccessfully requesting documents under the Freedom of Information Act (FOIA). AP resorted to legal measures after “careful deliberation and exhausting our other options,” AP general counsel Karen Kaiser said in a statement. According to AP, the State Department takes about 450 days to fulfill FOIA requests – seven times longer than the CIA and the Justice Department, and 30 times longer than the Treasury Department. AP is seeking copies of Clinton’s schedules and calendars during her tenure as secretary of state (2009-2013); documents and correspondence related to longtime aide Huma Abedin and advisers Cheryl Mills and Philippe Reines, who are likely to play important roles in a Clinton presidential campaign; documents related to Clinton’s role in the NSA surveillance practices and the 2011 Osama bin Laden raid; and documents related to Clinton’s oversight of a major Defense Department contractor. “State’s failure to ensure that Secretary Clinton’s governmental emails were retained and preserved by the agency, and its failure [to] timely seek out and search those emails in response to AP’s requests, indicate at the very least that State has not engaged in the diligent, good-faith search that FOIA requires,” AP’s legal filing says. Clinton has recently come under increased media scrutiny for using a personal email account during her time at Foggy Bottom, rather than the official government address. The email service was hosted on a private server, located at the Clintons’ New York property. At a press conference on Tuesday, Clinton claimed the emails never contained any classified information, and that the government-related messages she turned over would be made public eventually. According to The New York Times, Clinton “all but acknowledged that she was running for president” by going before the press to address the email questions.